On 26 February 2015 DfT permanent secretary Philip Rutnam wrote to Patrick McLoughlin to seek a ministerial direction on the requirement to replace Pacer railbuses by 2020 (included in the Northern / TPE franchises invitation to tender). Mr McLoughlin appeared to be quite happy to take responsibility. It is widely understood that the HS2 economic case is based on a series of highly questionable assumptions, and has been massaged to the hilt. Alternative upgrade-based investments (such as developed variants of RP2) outperform HS2 on almost every criterion, and the House of Commons Public Accounts Committee are sceptical about HS2’s prospects of delivering value for money. So what is curious, is Mr Rutnam’s concern about being on the hook for the value of money of Pacer replacement, but apparently not for the value for money of the (vastly larger) high speed rail expenditure. Network Rail is inefficient and has a poor safety record, according to its chief executive, Mark Carne (George Bradshaw Address, 25 Feb 2015). The George Bradshaw Address, hosted by Network Rail, the Rail Delivery Group & the Railway Industry Association and sponsored by Bechtel, is a prestigious annual lecture for senior figures from the rail industry to debate the future of the rail sector. On Wednesday 25th February Mark Carne, chief executive of Network Rail, will be setting out his views on the challenges facing the sector and hosting the evening will be Lord Adonis. Although slide #13 of Professor Andrew McNaughton’s February 2015 “Released Capacity” presentation was labelled “The Economic case for HS2: Assumptions Report: October 2013“, the diagrams on that slide do not appear in the Assumptions report. Furthermore, the indicative service patterns do not match (see illustration below). Diagrams from the PFM 4.3 Assumptions report and Prof McNaughton’s ‘released capacity’ slide 13. 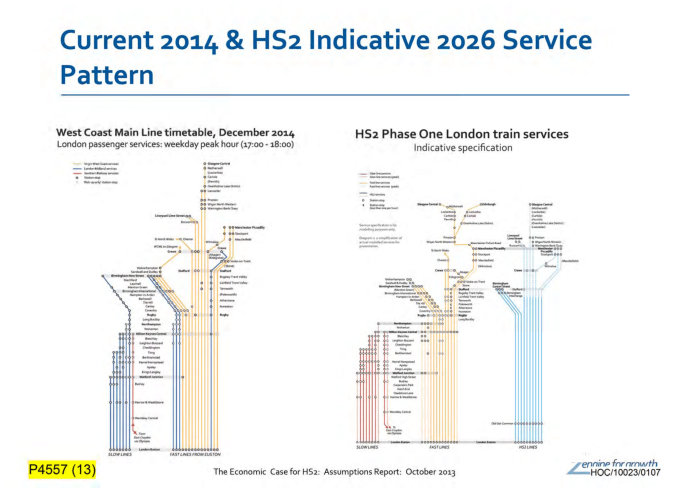 For all their shortcomings, these diagrams do give an impression of the scale of the reduction of classic Long Distance High Speed services proposed by HS2 Ltd.
HS2’s entire presentation is bogus, because the principal so-called ‘Do Minimum’ classic service patterns depicted are inferior to those which have operated on the West Coast line for the last five years. Since the Very High Frequency service started, the standard intercity service pattern between Birmingham and London has been three trains per hour, but HS2’s Do Minimum is ‘two, plus one running less than hourly’ (Figure 5-7). The service enhancements on the Slow lines, and beyond Birmingham (Figures 6-3 and 6-6) could be implemented almost immediately. 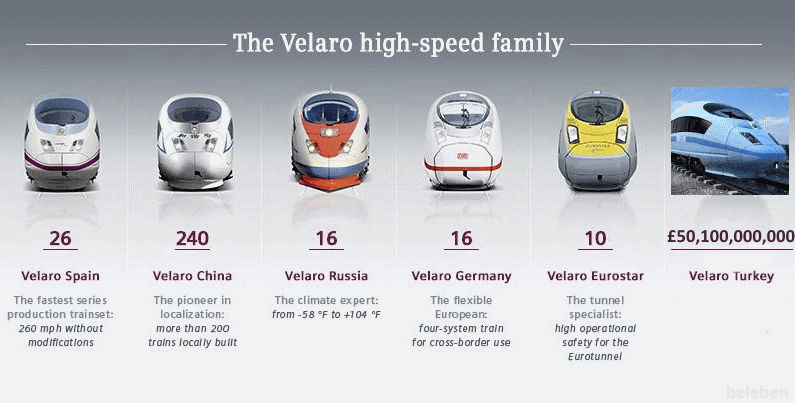 In no way are they dependent on, or a result of, capacity “released” by HS2. On 23 February, HS2’s Rupert Walker revealed the latest tranche of design slides for Euston station at a private meeting of rail officials and Camden community representatives, wrote Tom Foot. It appears that George Osborne’s plans to create “Oligarchograd” above and around the station are in jeopardy. […] The slides show a return to the idea of wedging a shed containing six high speed rail platforms on the west side of Euston Station, which would open in 2026. Five more platforms would be built inside the current station after 2034 in a move that could extend building works in Camden into the 2040s. This new “phase 1” of HS2 – the third different official proposal for Euston by HS2 Ltd in the last two years – would cost around £2.6 billion, officials told the meeting. HS2 released capacity. What is it? Slide #13 from Andrew McNaughton’s presentation on 13 February 2015 provided a representation of peak West Coast paths in December 2014, and in “2026” (when the new high speed line is supposed to open). So, the right hand, year-2026, diagram should show the benefits of released capacity. So which of the trains in the right hand diagram are actually running in the paths transferred to the new HS2 track? In practice, HS2 “released capacity” means little more than “the ability to stop WCML long distance trains at Milton Keynes”. Rail journalist Nick Kingsley has written a blogpost called “HS2: McNaughton outlines the released capacity win”, but neither he nor the Professor have explained what the released capacity actually is. There is no justification for — or need to build — hundreds of kilometres of high speed railway, just to allow a few people to make long-distance journeys northbound from Watford or Milton Keynes. Parts of the former LDV and Alstom sites in Washwood Heath can now be used for industrial development after the HS2 company agreed to give up its claim on the land following protests from Birmingham City Council and Birmingham MPs, the Birmingham Post reported. The land is part of a package of development sites, totalling 3.7 million sq ft [34.3 ha], and proposals for 9,000 jobs in the new ‘East Birmingham Growth Prospectus’ launched today. Hodge Hill MP Liam Byrne heralded the new prospectus and breakthrough on HS2 as a “triple win” for the city. He said: “This is the biggest plan for jobs in east Birmingham we’ve ever had. “It was hard fought. But, by demanding the Government, the council and HS2 pull together, we’ve got an amazing plan for jobs and skills. “Here, at Washwood Heath, we’ve forced HS2 to look at new plans to ensure 2,334 jobs are created rather than a giant train carpark – plus a £1 million investment in skills for local people and the city council’s regeneration plan. What a load of nonsense from Mr Byrne. His original proposal to relocate the “giant train carpark” away from Washwood Heath has been seen off by HS2 Ltd. His “jobs” claims seem to conveniently overlook the loss of existing employment on parts of the depot site. On 16 February 2015 Labour leader Ed Miliband spoke to Mary Rhodes on BBC Midlands Today about the party’s plans to create apprenticeships, and the HS2 railway. For some reason, his claim that HS2 should or would create “33,000” apprenticeships went unchallenged. Crossrail 1, a scheme valued at roughly 80% of the magnitude of HS2 phase one, has only managed 400-odd apprentices, and it is not clear how many of those apprentices were UK-domiciled before starting work. Each year in Britain, there are more than 700,000 eighteen year olds, so “creating 80,000 apprenticeships” is something which would benefit a minority. […] Labour would also raise the minimum standard for apprenticeships to national vocational qualification Level 3, introducing a new “universal gold standard” for apprenticeships. In 2013/14, just 25 per cent of 8,020 construction apprenticeship completions were Level 3 or above, while the remaining 75 per cent were Level 2 qualifications and would not meet Labour’s criteria. Under its proposals, Level 2 apprenticeships would continue but be renamed to protect the apprenticeships gold standard.